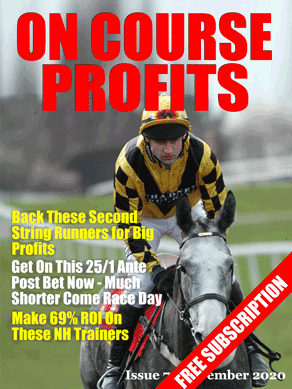 Today we've got a football perm, a racing selection, details of some bookie offers and details of the Colossus. The Colossus is a ten million pound bet for £2 and it starts at 12.45 today. This one will cost you £2 to enter and you have to predict the correct scores in the 7 Premier League matches today. The great thing about this bet though is that you can cash in your ticket along the way. So if things are going your way at halftime you can cash in part or all of your ticket and take some profit. Paddy Power are refunding your stake if your selection finishes second to the favourite in any of the TV races today. By the way the Profit Maximiser service shows members how to take maximum advantage of this offer, which pos up regularly with a number of firms. The best overall odds* for the ‘Best 5 Aways' are available with… VCBet where it will return £143 for £1 stakes. Boost Your Bank by Betting at Half Time!! You’ve all heard the cliché “It’s a game of 2 halves”, well now you can exploit this fact for profit! Start betting in the 2nd half of certain matches! Treat the 2nd half as a match in and of itself. The first half, therefore, becomes the launch pad for your betting decisions. Let me explain what I mean by way of 2 Examples from the time I wrote this article.. If you fancied Manchester City to win, you would be getting better odds at half-time in in-play markets such as those at www.bet365.com and on betting exchanges like www.betfair.com. Why are the odds on Manchester City bigger than they were pre match? Quite simply because in-play markets react to occurrences (or in this case, non-occurrences). Further, there are a multitude of other markets that will be offering bigger odds (than pre match). the article, we can be flexible. Let’s look at a few examples of 2nd half betting. In this Portuguese league match, Braga are 1.52 favourites against newly-promoted Gil Vicente. Braga scored 2 goals against the bottom 6 sides at home last season. Gil Vicente conceded 2 goals against Braga and 3 against Porto (2 sides in the top 3 last season, with Braga 4th last season). The 0-0 at half-time was therefore a shock… and, inevitably, in the second half the goals arrived. Possible profit-making areas? – Match odds – back Braga, lay the draw. Goals markets – back over 1.5 goals, over 2.5 goals. Correct score market – lay 0-0. Elfsborg are 1.33 at home. It is 0-0 at half-time. And the goals flowed in during the 2nd half albeit not for the team I expected. Still, a goals bet at halftime, at value odds, would have been successful. In this match, rangers were priced at 1.59 away from home against a team they had scored 4-3-4-2 goals against in their last 4 head to heads. half-time. Back Rangers to win the 2nd half. Here’s another half-time score line we can exploit, in this example there is a general tendency for one of the teams to be a strong market leader. Background – Derry are 1.14 favourites to win this match. Extremely strong favourites. However, this is not reflected in the half-time scoreline which sees outsiders Drogheda 0-2 up away from home. Now is the time to back a comeback by the 1.14 favourites. occasion as Derry did not win the match but would have backed a very short odds team at far greater odds). Lay Drogheda in the match odds at 0-2 at odds much lower than were available pre match. Lay 0-2 scoreline in the Correct Score Market. As this article is taken from the archives of What really Wins Money, I want to include some up to date examples of how we can enter the betting market in time for the 2nd half. Manchester United – a half time gold mine? A look at Manchester United’s performances in some matches this season relay that after the Fergie halftime hairdryer, they tend to up their game. Full time Manchester United 4 Wigan 0. As an aside, the above match is a great example of an alternative market we can focus in for half time betting, that is the 0-0 correct score market. Laying 0-0 at half time in matches where at least 1 goal is expected is a good policy because 1) we still have a 2nd half to go 2) the liability for the 0-0 correct score will have reduced dramatically from its pre match odds which is good news for layers. Getting to know a team’s habits can also help in determining a halftime strategy. Southampton this season are scoring regularly. So what do you do, as on 10th November, when its 0-0 in the Saints v Swansea match? You lay said 0-0 as you could have done in a couple of Manchester United matches. I did that at nice odds of 3.5 ( shorter the better for layers) and the 2nd half produced 2 goals. Look out too for teams such as Real Madrid who as recently as 27th November were playing at home to Alcoyano in the Cup. Guess what the score was at halftime? 0-0. The fulltime score was 3-0 to Real Madrid. In this instance if a 0-0 would be a huge shock, you can delay your entry into the betting market as late as possible in order to lay the 0-0 at shorter odds or indeed back Real Madrid at better odds. This tactic I call Delay-react-trade and is something for a future article. www.bet365.com and www.betfair.com) because the expected result has not materialised. – Backers can back their original fancies at better odds. – Layers can lay markets at lower odds (and remember betting exchange layers want low odds when they lay). team talks can work wonders (ask Benitez in THAT Champions League Final). So which matches do you choose? indicate they are the hot favourites. I normally focus on matches where one team is 1.6 odds or over and wait until half-time. exchanges like Betfair, and utilise the value odds available for both backers and layers. Today's Racing Selection courtesy of Value Backing Extra.